WASHINGTON, D.C. -- Tunisians' confidence in their Islamist-led government evaporated in the last year, dropping to 32% in May 2013 from 56% in March 2012. Their approval of the country's leadership fell even more over the same period, tumbling to 23% from 60%. Tunisians' trust in their government showed signs of major erosion in late 2012 and has not recovered. Thousands of Tunisians took to the streets in early August, demanding the resignation of the national government, which is led by the Ennahda Party. The protests prompted the speaker of the National Constituent Assembly to announce the suspension of the elected body's activities until the government and opposition start talks. Despite the Ennahda Party's reservations, it has accepted the suspension and is urging talks to form a unity government. The long delay in finalizing the country's new constitution has likely worn down some Tunisians' confidence in their government. Further frustrating Tunisians could be the killings of two opposition politicians. Media reports suggest protesters in Tunisia may have been emboldened after the demonstrations in Egypt factored into former President Mohamed Morsi's removal from power. Tunisians' continuing struggles to get by may also be eroding their confidence in their government. Tunisians' perceptions of their financial situations worsened considerably after the late 2010 revolution and have yet to improve. Fifty-nine percent say they are either living comfortably or at least getting by on their present incomes, down from 77% in 2010. Similarly, the 41% who say they are finding it difficult or very difficult to get by is about twice as high as it was in 2010. The worsening economic conditions affect the entire population, regardless of socio-economic status. 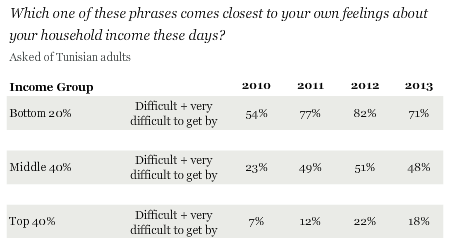 Among those in the poorest 20% of the population, more than seven in 10 say they are finding it difficult or very difficult to get by on their household incomes, up from 54% in 2010. Even relatively better-off Tunisians are showing signs of economic stress. About one in five of those in the top 40% income group report finding it difficult or very difficult to get by, up from 7% in 2010. The current political crisis is not independent of deteriorating labor market conditions. In May 2013, 71% of Tunisians said it was a bad time to find a job locally -- significantly higher than the 59% who said so in 2010. Labor market prospects that were already poor in the pre-revolution era generally worsened after the revolution. About one in five Tunisians in the workforce are currently unemployed. Current public protests demanding the resignation of the national government show many Tunisians are unwilling to wait for the results of the next elections, which are scheduled for December 2013. Taming the economic elephant in the room continues to prove to be the main challenge for Tunisia's post-revolution leaders. The country's expected GDP growth in 2013 is 3.4%, similar to the anemic economic performance seen in 2010, on the eve of revolution. With more Tunisians finding the job climate worse now than before the revolution, economic performance is likely to be the main benchmark against which this government and any future governments will be evaluated. Results are based on face-to-face interviews with 1,053 adults, aged 15 and older, conducted May 20-30, 2013, in Tunisia. For results based on the total sample of national adults, one can say with 95% confidence that the margin of sampling error is ±3.3 percentage points. Results for prior waves are based on interviews with a minimum of 1,000 adults each period. The margin of error reflects the influence of data weighting. In addition to sampling error, question wording and practical difficulties in conducting surveys can introduce error or bias into the findings of public opinion polls. In the lead up to President Mohamed Morsi's ouster, "suffering" in Egypt rose to 34%. In addition, a record 80% of Egyptians saw their economy as getting worse. Most Palestinians likely have low expectations for the peace talks taking place in the coming weeks between the Palestinians and Israelis, as 74% of Palestinians do not expect a permanent peace accord will ever be realized.